“Using chickens not only violates 15 laws and regulations including public health codes, sanitation laws, child labor laws, slaughterhouse regulations and animal cruelty laws, but also several mandates and imperatives from the Torah and Talmud,” said Rina Deych, a founding member of the Alliance to End Chickens as Kaporos. According to the alliance, this use of chickens has been condemned as unethical and contrary to the spirit of Jewish tradition by dozens of Orthodox rabbis all over the world. It has been deemed a health hazard by a well-respected toxicologist for putting New York residents and visitors at risk of contracting E. coli, Salmonella and other transmittable diseases. Despite the protests, the annual ritual continues in New York City. This year an estimated 60,000 baby chickens suffered the trauma of transportation from factory farms to Brooklyn where they spent five days crammed inside crates stacked on the side of the streets. According to the Woodstock Farm Sanctuary, an estimated several thousand died of starvation, dehydration, exposure and injury, and their bodies were discarded like trash into garbage bags and dumpsters. When the ritual finally began, the young chickens who survived and were now weak from lack of food and water were held by their fragile wings—painfully pinned together behind their backs—and swung over the heads of the practitioners. In some cases, the chicken’s bones snapped during this horrific practice. Activists managed to rescue about 200 chickens. These precious birds are now experiencing compassion and kindness for the first time in their lives at local sanctuaries. Rehabilitation at the Woodstock Farm Sanctuary includes around-the-clock care. These birds were being raised for the meat industry so their bodies were genetically manipulated for faster growth. According to the sanctuary, at between 5 and 7 weeks of age factory farm chickens spend 76 to 86 percent of their time lying down due to lameness and deformity. Caregivers are working to strengthen the chickens’ legs with physical therapy. Specially designed rubber bands are being used to help straighten their legs. And there are other problems, too. Chickens are tossed or stuffed into crates at the factory farm before being loaded onto trucks. Many birds suffer bruising, broken bones, dislocation and hemorrhage during catching and crating. 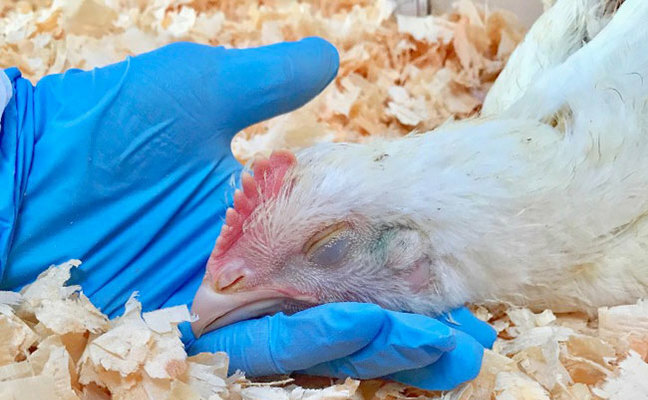 Once on the trucks, chickens are subjected to further overcrowding, trampling and suffocation; food and water deprivation for up to 28 hours; noise, vibration and motion stress; and often grueling temperature extremes. Among the survivors now living at Woodstock Farm Sanctuary are Rebecca and Bianca. 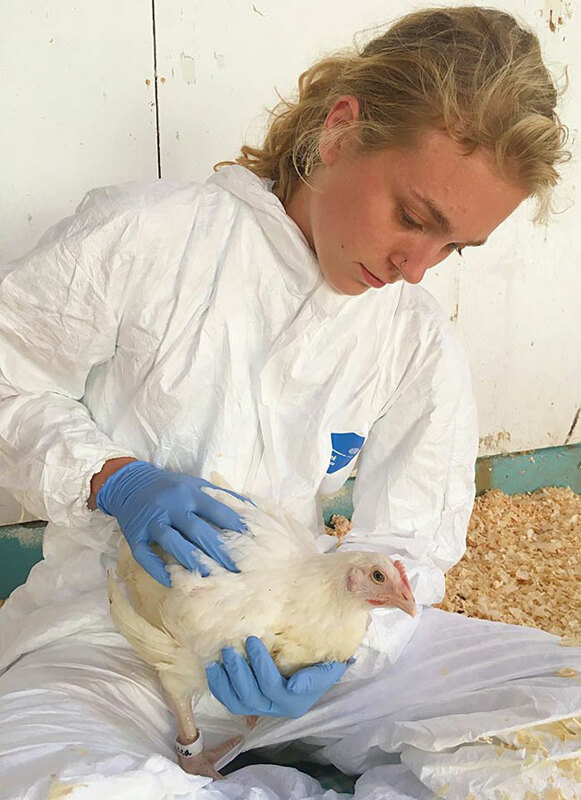 Rebecca is sick from the conditions she was raised in on the factory farm but will recover. One of Bianca’s wings was severely broken during transportation and had to be amputated. She is doing well following her surgery. “Bianca is a sweet, spunky and loving chicken who is developing a bond with her caregivers,” McCrystal said. Bianca had to have a wing amputated after being rescued from the Kaporos ritual in Brooklyn, NY. 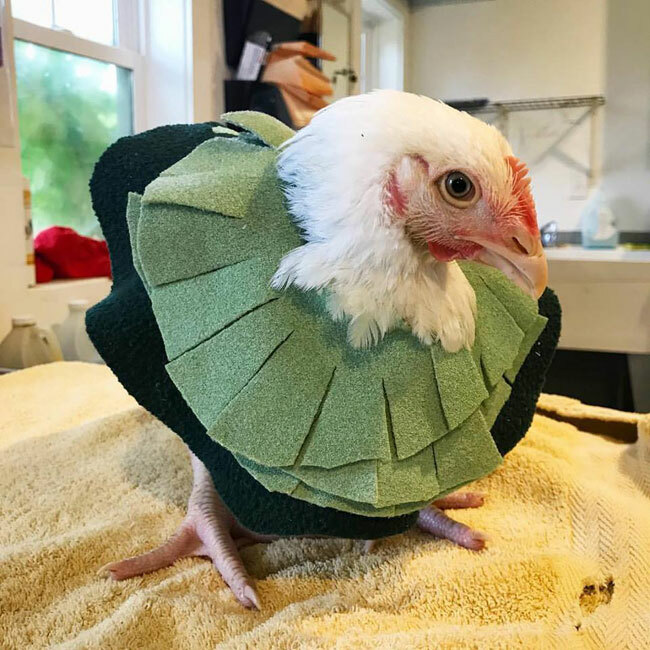 She is recovering in her stylish Elizabethan collar at Woodstock Farm Sanctuary. It’s hard to imagine that after the cruel treatment these birds received that they would ever trust humans again. Just how quickly rescued animals do trust depends on the individual animal, McCrystal said. The rescued chickens are already starting to bond with sanctuary caregivers. To learn more about The Woodstock Farm Sanctuary or to help with the emergency care of the Beloved Birds rescued from the Kaporos ritual in Brooklyn, NY visit their website.